Now we have a unit to measure with – the decibel – we might want to think about what we want to measure! Noise pollution arises from traffic noise, trains, planes, factories, ice-cream vans, neighbour’s sound systems and mobile ring tones too! People in the UK live pretty close together and this means that we can easily annoy each other – not least by making noises that other people find objectionable. 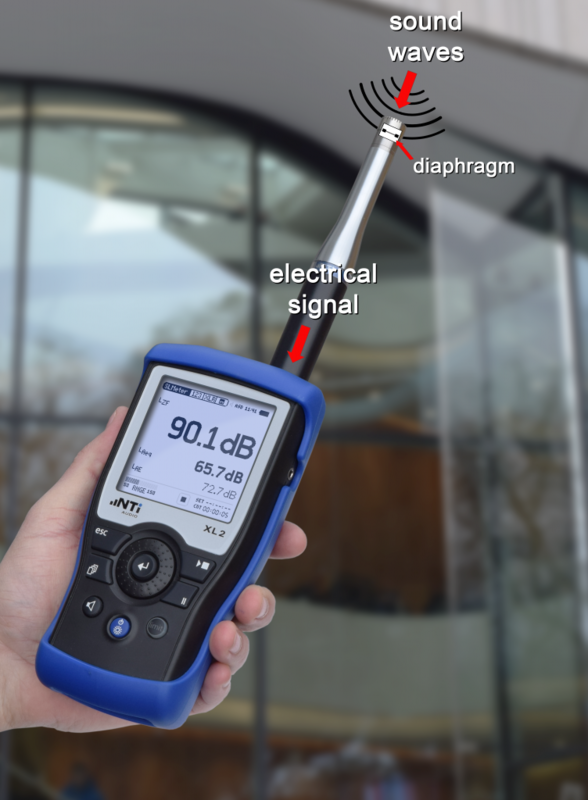 Noise is measured using a sound level meter which gives readings in dB. There are many regulations and laws to control the amount of noise that is acceptable, and the enforcement of these laws often comes down to Environmental Health Officers working for your local council. Ideally, noise can be designed-out of a situation during the planning stage, but very often planning goes wrong and then sorting out noise pollution can get very expensive. For example, people living next to a busy road or railway line often experience noise. If this noise is too disturbing, there are several methods to make things quieter. These include placing barriers between the house and the noise source to help block the sound, or fitting double glazing to stop the sound travelling through the windows of the house. Noise pollution and its effect on learning in schools and colleges has become a big issue recently, and acoustics plays an increasingly important part in the design of new buildings for this purpose. Noise has been shown to affect how well students learn in schools. The many sources of environmental noise that have to be prevented from entering a concert hall. Noise isn’t just annoying, sometimes it can be dangerous. Before regulations were imposed to control noise levels in factories, people often became deaf over time due to noise exposure at work. You may know older relatives who have trouble hearing – everyone’s hearing deteriorates with age, but noise exposure can make this much, much worse. 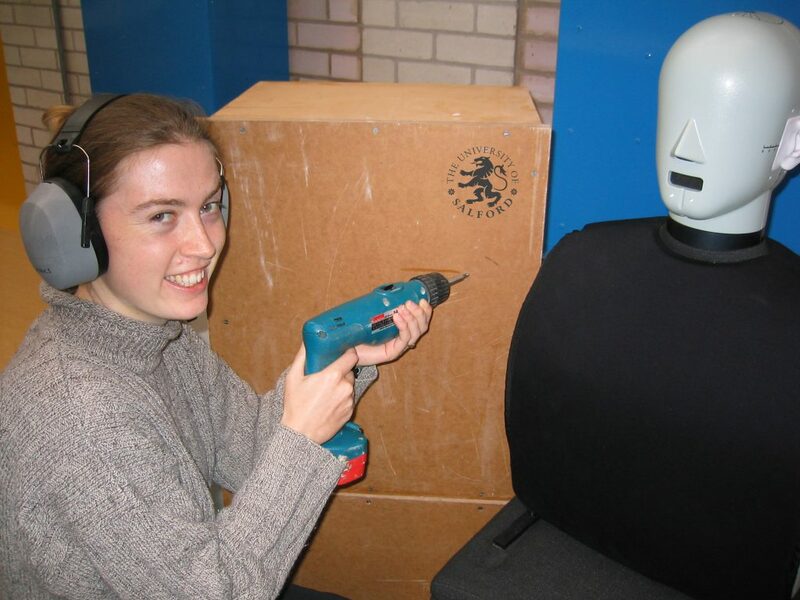 Today, workplace noise is controlled in law, and people who work in noisy environments often wear ear defenders to cut down noise levels as shown in the picture below. Protecting your ears using ear defenders. You might think that noise-induced hearing loss is a thing of the past. Unfortunately this is not true, as exposure to a high level of any noise can cause temporary deafness, and repeated exposure over a period of time can cause permanent hearing loss. This includes exposure due to personal sound equipment as well as music exposure at clubs and gigs. Whilst many people might consider it a little eccentric to go for a big night out wearing industrial hearing defenders, small ear-plugs are widely available and are very widely used by people whose hearing is essential to them – musicians, mix engineers, broadcasters and so on. This is what the charity Action on Hearing Loss recommends for safe listening to music. This page has comprehensive resources for group activities designed to explore sound, hearing and noise. Covers aspects such as what makes a sound pleasant, the ear anatomy and hearing damage. Originally developed for use in science museums during school visits, but could also be used physics lessons.